Gold hasn’t exactly glittered over the last few weeks. After hitting a recent high back in March, the uber-popular SPDR Gold Shares (NYSEARCA:GLD) has spent the rest of the year falling, and is now about 8% lower. All in all, a variety of factors and issues have continued to pressure the metal itself and the various gold stocks that produce it. But the luck of the gold stocks may finally be changing for the better. Trade and geopolitical tensions, rising inflation and a falling dollar are all working in gold’s favor. To that end, many analysts now believe that the precious metal has bottomed in recent sessions. Last week was gold’s first weekly gain in nearly a month. Those gains for the metal should keep coming as the various factors take hold. And as we know, higher gold prices equal higher profits at the gold stocks. Which could mean that the time to buy the miners is now. For investors, the following five gold stocks could lead to plenty of gold in their portfolios as prices rebound. Once the kingpin of the gold stocks, Goldcorp. (NYSE:GG) hasn’t exactly lived up to its golden moniker lately. The firm has suffered and trailed behind its rivals as higher costs and lower production have hurt its bottom line. Last quarter, the firm missed big-time when it came to its expected profits. But updates since then have been pretty positive. Back in 2016, GG set forth on a growth and turnaround plan. That plan centered around a 20/20/20 idea of raising both gold production and reserves in the ground by 20%, while also reducing all-in sustaining costs (AISC) by 20%. Last quarter, Goldcorp slipped on these fronts. After all, you need to spend money to make money, and costs related to its plan took a big bite out of its bottom line. But management has reaffirmed its full-year guidance for gold production of 2.5 million ounces and AISC of just $800 per gold ounce. Getting there includes plans to boost production at a handful of mines as well as cut about $250 million in annual sustained efficiencies by the end of the year. With gold prices rising, GG will have a better shot at making this scenario come true. All in all, better cash flows from higher gold prices will help it along. If gold really has bottomed, then the turnaround at GG will be all that better. Franco-Nevada Corporation (NYSE:FNV) is a unique bird among the gold stocks. That’s because it isn’t a miner — it’s a streaming firm. That is, in exchange for royalties on production, FNV provides capital to other miners. It’s a highly profitable business that generates plenty of cash flows without many of the risks associated with physical mining. Last year was booming for Franco-Nevada. This year … not so much. During the first quarter of the year, Franco-Nevada saw its revenues grow by less than a percent and total precious metals production was down sharply. With gold prices dipping further this past quarter, FNV stock has sunk about 14%. With the bottom in, now could be a great time to snag this gold stock bargain. For starters, higher gold prices will directly correlate to higher royalties paid to FNV. That’s the easy and near-term win. The longer-term win could be FNV’s decision to fully fund and develop its Cobre Panama project. 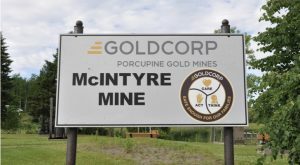 The project is one of the world’s largest copper-gold-silver deposits currently being constructed and initial tests for reserves have come back very positive. Franco will own royalties on 100% of the miens production. As Cobre Panama kicks in by the end of 2018, FNV’s cash flows should really start growing. The best part, is FNV’s current valuation doesn’t reflect any production or gains from this project. That means that FNV is a play on gold’s rise today and tomorrow. 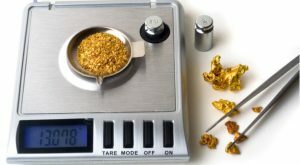 The lingering problem for once-mighty Kinross Gold (NYSE:KGC) is finally ending and that could allow it see its fortunes shine once again. Even better as gold reverses and starts trending higher once again. KGC’s troubles started back in 2010. It was at that point that the miner paid some big-time bucks for several mines. That would have been fine, except Kinross basically purchased these assets right at the top of the gold bubble. Naturally, the high debt incurred to buy these mines as well as the cratering gold prices hurt KGC tremendously. But all of that may finally be behind it. Kinross has been able to reverse the asset impairment charges stemming from its 2010 bone-headed purchase. This combined with asset sales provided KGC with its first profit in years. At the same time, Kinross has plenty of new projects coming online — including that maligned purchase — over the next few quarters. As gold ramps up in price, this is perfect timing. It looks even better when all-in cash costs continue to plunge. All of this puts KGC investors in the driving seat. They may finally get the break the miner deserves. And yet, for a P/E of just 12, Kinross is being tossed aside even among the gold stocks. Investors should snap this bargain up while it lasts. To say that Yamana Gold (NYSE:AUY) has been a disappointment would be an understatement. During the gold boom, AUY was one of the top gold stocks. But like previous picks GG and KGC, it fell on hard times and has sunk hard. Today, you can score shares of Yamana for around $3 — a far cry from the $15 per share it fetched during the boom. And could be just when you want to start buying. The reason is that AUY is one of the few gold miners seeing stronger production numbers in the higher price environment. thanks to several new mines — including its better-than-expected Cerro Moro mine- coming online that were purchased in the boom, Yamana now gold production to jump 18% over the next three years. Silver production should surge more than 159% in the same time frame. At the same time, after the initial ramp-ups to get these mines going, cash costs for the firm are expected to drop significantly. That will allow it to reap bigger margins for every ounce. And yet, investors are throwing away the profitable miner and not realizing its full potential. Heck, AUY even pays a dividend! When it comes to gold stocks, AUY could be one of the biggest bargains out there. The long-term opportunity is shining and investors can get that potential at a steal of a price. The miners are often seen as a leveraged play on the price of gold. Their fixed costs provide a greater than 1:1 gain when gold prices rise. For an even greater leveraged effect, the key is to focus on the junior miners. Serving as entry exploration companies, many of the juniors have just one or two mines under their belts — which may or may not, be operational yet. The juniors will often take the risk to get these claims started. This is when the majors usually step in and buy out the gold production. This means that the juniors are often the key pieces to future gold supplies. When prices rise, the juniors are more valuable due to the amount of gold in their potential reserves. 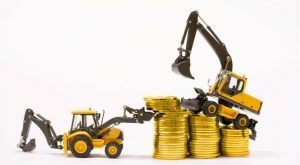 The risk of owning a single junior miner is great, which is why the VanEck Vectors Junior Gold Miners ETF (NYSEARCA:GDXJ) is a great choice. GDXJ owns a basket of 73 different junior miners. By using the ETF, investors can diversify their gold stocks risk and gain the extra leverage with the ease of a single ticker. Volume or the ETF is swift and features more than $5 billion in assets. In the end, the ETF is a bigger, better bet than some of its holdings. With expenses of just 0.54%, or $54 per $10,000 invested, it’s a cheap choice as well. As of this writing Aaron Levitt did not hold a position in any of the aforementioned securities. 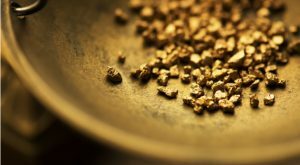 Article printed from InvestorPlace Media, https://investorplace.com/2018/07/5-gold-stocks-to-buy-if-a-bottom-is-in/.